Size: 18" x 60" Training Convenient commercial grade training table that is designed to withstand thetest of time. Flash Furniture's 18"W x 60"L Folding Table features a durablestain resistant blow molded top and sturdy frame. This lightweight 5 ft. tablelocks in place in a SNAP with the leg locking system for easy set-ups. Thespace saving design can allow multiple tables in a small to large settingmaking it the perfect training style table for the classroom or any trainingfacility. 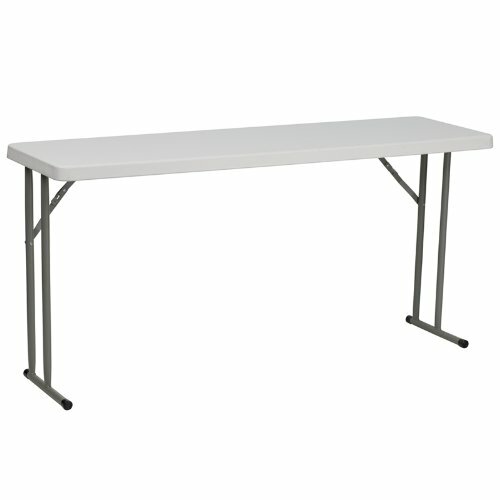 Not only does this table make a great training table, but can beused in banquet halls or for everyday use in the school. [RB-1860-GG].